The cover paper represents the Angel in "Tobias and the Angel" whom I see as tall, slim, still and quiet. 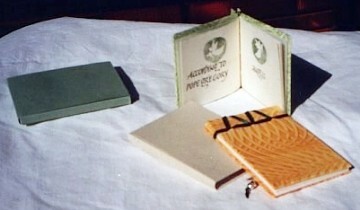 The covers are a variation on Japanese Bindings. The three-hole binding is my own design as is the idea to sew with ribbon. The airbrushed illustrations were a sudden last minute idea. I like my books to have cases if possible and the folded slipcase is, to my mind, the finishing touch! Text: Zerkall. The cover colour represents that lovely passage in the Gospels where the Shepherds see the great Host of Angels and "the Glory shone all around them".